The following long passage is an excerpt from an article entitled: The Islamic States of America? Therefore, reading "A rare look at secretive Brotherhood in America," in the Chicago Tribune on Sept. 19 caused me to startle. It's a long analysis that draws on an exclusive interview with Ahmed Elkadi, the Muslim Brotherhood leader in the United States during 1984-94, plus other interviews and documentation. In it, the authors (Noreen S. Ahmed-Ullah, Sam Roe, and Laurie Cohen) warily but emphatically acknowledge the Islamists' goal of turning the United States into an Islamic state. Brotherhood members emphasize that they follow the laws of the nations in which they operate. 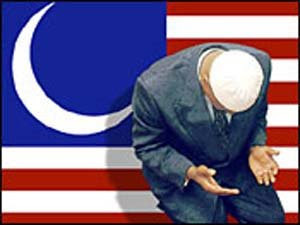 They stress that they do not believe in overthrowing the U.S. government, but rather that they want as many people as possible to convert to Islam so that one day—perhaps generations from now—a majority of Americans will support a society governed by Islamic law. This Brotherhood approach is in keeping with my observation that the greater Islamist threat to the West is not violence – flattening buildings, bombing railroad stations and nightclubs, seizing theaters and schools – but the peaceful, legal growth of power through education, the law, the media, and the political system. The Tribune article explains how, when recruiting new members, the organization does not reveal its identity but invites candidates to small prayer meetings where the prayer leaders focus on the primary goal of the Brotherhood, namely "setting up the rule of God upon the Earth" (i.e., achieving Islamic hegemony). Elkadi describes the organization's strategic, long-term approach: "First you change the person, then the family, then the community, then the nation." His wife Iman is no less explicit; all who are associated with the Brotherhood, she says, have the same goal, which is "to educate everyone about Islam and to follow the teachings of Islam with the hope of establishing an Islamic state." he found out that the U.S. Brotherhood had a plan for achieving Islamic rule in America: It would convert Americans to Islam and elect like-minded Muslims to political office. "They're very smart. Everyone else is gullible," Saied says. "If the Brotherhood puts up somebody for an election, Muslims would vote for him not knowing he was with the Brotherhood." Citing documents and interviews, the Tribune team notes that the secretive Brotherhood, in an effort to acquire more influence, went above ground in Illinois in 1993, incorporating itself as the Muslim American Society. The MAS, headquartered in Alexandria, Va. and claiming 53 chapters across the United States engages in a number of activities. These include summer camps, a large annual conference, websites, and the Islamic American University, a mainly correspondence school in suburban Detroit that trains teachers and imams. MAS does not believe in creating an Islamic state in America but supports the establishment of Islamic governments in Muslim lands. The group's goal in the United States, he says, "is to serve and develop the Muslim community and help Muslims to be the best citizens they can be of this country." That includes preserving the Muslim identity, particularly among youths. In suburban Rosemont, Ill., several thousand people attended MAS' annual conference in 2002 at the village's convention center. One speaker said, "We may all feel emotionally attached to the goal of an Islamic state" in America, but it would have to wait because of the modest Muslim population. "We mustn't cross hurdles we can't jump yet." Do you believe Obama is knowingly or unknowingly an integral part of this movement? That would be hard to say, Christine, even if I knew a lot about Obama, which I don't. I don't believe the Muslims have enough numbers yet in America to have a significant amount of political clout. They're working on it, but they aren't there yet. Just a theory; I believe they see Obama as there very first open door to our government. No, not a total takeover. But, a beginning. I believe Islamists will see Obama as an apostate and try to assassinate him if he becomes president. Yes, an unwritten concern in my post at IBA. A hot, untouchable subject we won't be hearing about. No, Obama may not be a Muslim now. But, whether people like it or not, his ties and connections are wrought with risks. Whether to him or us. The truth is we don't know. I mean it is possible they could decide to let him live despite the fact that they see him as an apostate, if they think he is enough of a useful idiot that they can take advantage of him. Than when the Islamists think he is no longer useful to their cause, then they might kill him. The enemy of the West is NOT ISLAM (the nations or the new Islamic super state in the making), but our own Liberal Systems and Islam within our borders. Your Bill of Rights and your Constitution now is the greatest enemy of the USA. The real threat is the non Muslim Administration (Not just Obama, but all Presidents), the Elite and camp followers; run by the liberals (Of every colour not just your high-jacked words; of Republicans “Guilty” or “Democrats” guilty, who run rampart in every top down sphere of your life. Guess what? The rest of the West has barred their nether regions to the cross of multiculturalism! The SLOW DEATH to a host culture. Dear Readers, I do appreciate your blogs as it shows some sanity in the great unmentionable in our societies, the great non debate, “The conquest of the West, by Islam”. My concern with the blogs is that the subject generates Obfuscation as every one weighs in with the “Thousand and one nights” rather than dealing with the direct intractable problems posed by Islam to the West. I have no concern (except I will not be able to use my car as much), that the Muslim world is throwing off the despots propped up by Western interests; its their time. My concern is refugees, migration and the growing influence of Islam within our own borders (The West not just the USA). Our very liberalism is our weakness. We live in an age in the West, of short memories, where, today is the focus and virtually all forget the lessons of history. Remember 376 – 378 AD and Battle of Adrianople. Valens (My blog name) took in the Goths... My point is simple how can the West deal with a powerful external Super State who's Ultimate leader is Allah, while the adherents who live in the West; who in the main are good citizens bend our Western culture to their needs through the ballot box. “The West will not be defeated by the Caliphate simply occupying our land but by a process of “Balkanisation” and or cultural partition or to the West some form of Apartheid. Gloomy but the West is currently welcoming the incoming tide! I subscribe to the Alexander the Great theory of battle, “Find their point of greatest strength, here lies their point of weakness.” They have found ours. More if you are interested in what we of the West must do. i believe that obama is islam and still islam. why? because he is from indonesia. indonesian are different. i am muslim and i eat pork but not drinking alcohol because i dont like. i know people that drink alcohol but dont eat pork. i know people that do both. i never go to mosque and pray but i know people that do that. obama father is alcoholic muslim and loves whore. homosex is treated bad but nobody harm then. even in 2010 homo became normal and nobody try to kill them. this is akhlaq (muslim morality). people had low, medium, high or nothing at all. as for me i had no akhlaq and atheism tendency. why? because we dont choose this. we born with this. why should we held responsibility for something we never decide? so, yes... obama is muslim and try to islamization the whole world. dont say he eat pork and beer, he cant be muslim. i ask why? as obama father is alcoholic. and some muslim eat pork secretely. obama definately muslim. he try to make the whole world muslim. and by doing jihad your sin will forgiven.